When it comes to finding a heating and cooling system, you would not want to take any chances. You definitely want to provide comfort to your family with a durable, efficient and value for money HVAC system. In choosing a brand, Nest is considered to be one of the most reputable brands in the HVAC industry. 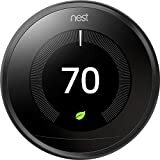 The Nest Thermostat 2nd Generation is a hit and just recently, they launched the Nest 3rd Generation Thermostat. How does this product fare when it comes to design, performance and specs? How is this different from the previous predecessor? Let’s take a closer look. The latest design from the brand still has the same round design using stainless steel dial, but there are major changes. The Nest 3rd Generation Thermostat showcases a 40% bigger screen that has a much better resolution compared to the previous models for easier visibility. The display gives you 229 pixels per inch which is 25% than its previous models which means that it has much improved on-screen image quality. Having a larger screen and improved screen, you have an HVAC system which makes it easy for you to see the details even when you are looking at it from a distance. With its slimmer design, the thermostat profile does not stick out. The Nest 3rd Generation Thermostat gives you a much more improved and ease of use system with better functionality. It boasts Farsight which allows you to see the target temperature or the time via the digital or analog mode. Even from a distance, you can see the time and temperature so you no longer have to go directly to it and you can just look at the temperature a few feet away. One thing that you will like about the Nest 3rd Generation Thermostat is that it comes with improved performance. With its family account feature, users in the household can easily set up their own account where they can track the phone location of every person. Basically, this feature helps you see the whereabouts of people living in the house. 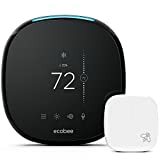 The other competitor, Ecobee3 thermostat may have its new HomeKit, IFTTT channel, remote temperature sensors and Alexa integration. But when it comes to the functionality, usability and design, the Nest Thermostate 3rd Generation is still the better choice. To avoid overheating, the Nest 3rd Generation Thermostat has a Furnace Heads-up function which track the times as to when the forced-air furnace turns off. If it there is any problem, the system alerts you on the screen and you can also receive on your email the energy usage per month. When it comes to performance, the brand delivers and is at par with other heating and cooling systems in higher price brackets. Although it has its share of downsides, you can never go wrong in choosing the Nest 3rd Generation Thermostat with its over-all performance and usability. In installing the Nest 3rd Generation Thermostat , you will not have any difficulty as it is considered to be one of the easiest to install. It has screwdriver and rectangular baseplate used to cover up holes and steel plate that you can use for mounting the system. After a few minutes, your HVAC system is ready to use. The 3rd Generation has a lot to give when it comes to new features. Its predecessor like the Nest 2nd Generation mainly rely on near-field sensors for motion activity and what is nice with this model is that it has far-field sensor. Even from a distance, you can see the temperature especially since it has now a much larger screen. You can simply download the Nest app on your iOS or Android phone. It is compatible with 95% of heating and cooling systems (24V) which includes geothermal, solar, radiant oil, hot water, forced air, gas and electric. Its heat pump comes with O/B, AUX, E emergency heat and it also has humidifier, dehumidifier and fan. In using the remote control, you can use wifi-connection provided you have Internet access and you have a Nest app installed on your device. For its price, the Nest 3rd Generation Thermostat is a good choice especially since it has more improved design, functionality and features. Although it has downsides especially when it comes to the accessory department, but when you look at its over-all performance, ease of use and quality, it gives you the innovative features that you need. You get to have an HVAC system that is worth every price. With all the features that this system has to offer, you get to provide comfortable temperature for your loved ones. It is very easy to use and install. You will not have a hard time operating the HVAC system with its far field sensors and Wi-Fi features. Simply download the Nest app and you are good to go. In the end, you can choose among other brands and models. Do check out our article on some of the best thermostats that best fit your budget, lifestyle and other requirements. Warranty: 2-year limited manufacturer’s warranty, parts only, no labor. For help, visit nest.com/support.